This happened in 1971. The Guru Poornima celebrations were on in Prasanthi Nilayam. As always Swami was extremely busy attending to the thousands of devotees who had gathered. 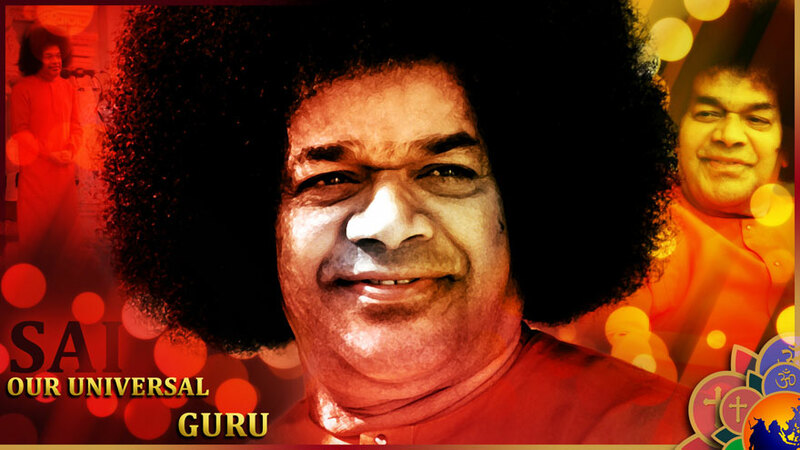 During this period, one morning when Mr. B. V. Ramana Rao went up to Swami's room, he saw that Bhagawan's robe was wet with sweat; Swami looked visibly tired. In fact Swami had a late lunch that day as He was busy all morning personally distributing theertham (sanctified water) and granting pada namaskaram to at least 2,000 lucky souls. 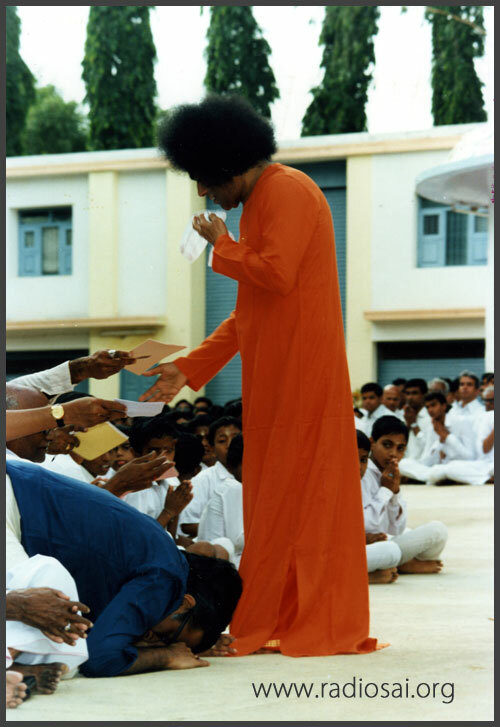 Once He started at 8.30am, Swami did not stop until everyone had their share of the special blessing. He continued to walk non-stop for three hours, bending and pouring with a silver spoon the aromatic ambrosia into every cupped hand, one after another. For the devotees it definitely was a unique gift of darshan, sparshan and ethereal prasadam! Mr. Ramana Rao had the opportunity to hold the silver bowl as he walked behind the Lord. 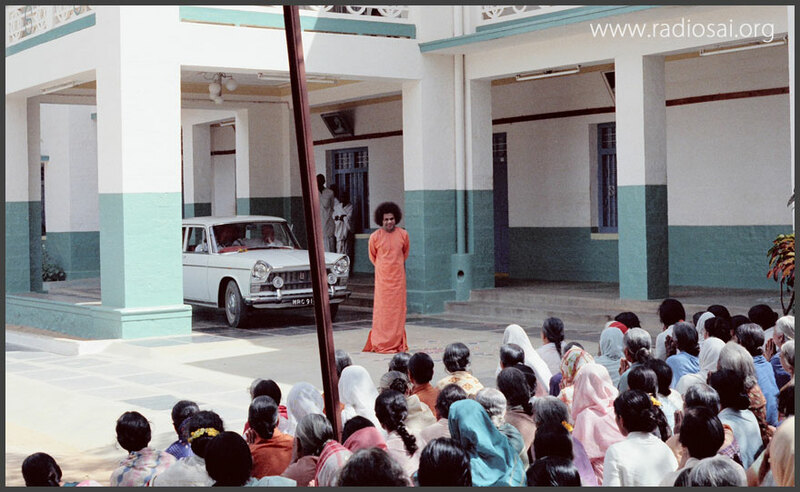 The previous night itself Swami had instructed him to inform every person in Prasanthi Nilayam, whether they were car drivers, washermen, cooks, elderly devotees, the disabled or the other residents - all of them were to be in the Mandir by 8am the next morning. Once the distribution concluded, Swami again enquired with Mr. Ramana Rao if there was any one who had missed. Only when He was completely satisfied did He enter the interview room. Here, He conferred this blessing onto the cupped hands of Mr. Ramana Rao too, and lovingly accepted the handkerchief he offered. Bhagawan used that white linen on His soft face and returned it as His gift to him. Then He retired upstairs. Those days Mr. Ramana Rao, along with another dear devotee Mr. Khayal Das, had the chance to 'assist' Swami during darshans by holding letters, carrying the vibhuti bag, etc. Every afternoon he would be ready by three and wait for intimation from Swami to go upstairs. That day he guessed Swami would take a longer rest than usual before He emerged again for evening darshan. So he leisurely sauntered into the interview room past 3pm. But as soon as he stepped in, he was summoned to Swami's room. 'Bhagawan would most likely still be resting today, probably darshan will be postponed’, he guessed. But when he reached His presence, he was flabbergasted, actually a bit shocked. Swami was not only not resting but was fully ready and eager to step out; in fact He had been waiting for him since 2.30pm! The only One in this world who is beyond the karmic cycle and has no obligation to busy Himself with anything, works incessantly on His own volition, only for others welfare. Whereas we, who have plenty of duties and rightful responsibilities, at times want to take it easy. Isn't this something to think about? 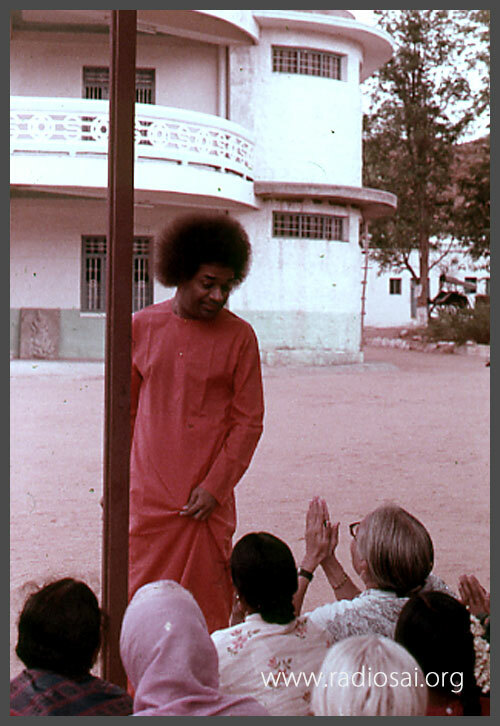 Again, on another Guru Poornima day, now in 1976, Swami had spent the entire morning visiting the new houses that He had constructed for the harijans (economically most disadvantaged section of Indian rural societies). A flood in River Chitravathi had washed their huts away, and Swami had now built for them permanent structures. 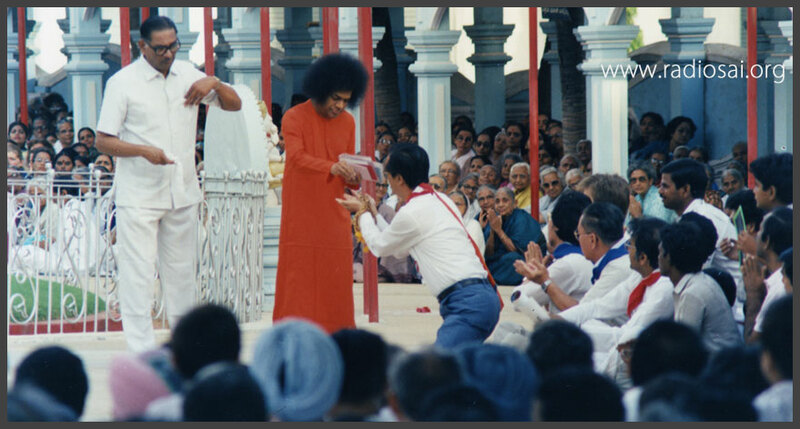 Not only this, Bhagawan had also provided employment to every one of them by assigning them work inside the ashram premises. That morning He had gone to personally assure them that He is always with them and would look after their welfare in every way. The delight that he lighted in the hearts of those hapless people was a sight which would make even the most depressed person on earth blossom into a smile. Yes, they were so happy. Even the Lord was ecstatic; He revelled in their happiness and spent 3-4 hours with them, talking to them, moving from one house to another, listening to their woes, blessing an infant here, caressing a child there and so on. Mr. Ramana Rao was shaken to his bones. He sat there transfixed to the spot, perspiring profusely. The profundity of the message notwithstanding, the functioning of Divine Omniscience at that lightning speed just left him speechlessly dazed. His mind went blank, muscles became still. It is only because the Divine always sees us as atmas, as His reflections, that He loves us so unconditionally and so mercifully. We may have a million shortcomings, we may have faltered a thousand times, we may not have trusted Him to the extent He wants us to, we may not have truly loved Him with all our heart, all our strength and all our soul, still He waits for that slightest opportunity to lift us, to save us, to hold our hands and fill us with His love. Yet again, absolutely unconditionally. That is also the reason why He loves all regardless of whether one is a spiritual giant, a proud intellectual, a selfish devil, a clever ignoramus or an honest gentleman. Or, whether one occupies an exalted office and wields power and wealth, or has spent all his life trying to keep his flesh and bone together precariously moving from one challenging circumstance to another – all for his very day-to-day survival. “I will share with you a telling episode to illustrate this,” Mr. Ramana Rao went on, “This too happened in the seventies. 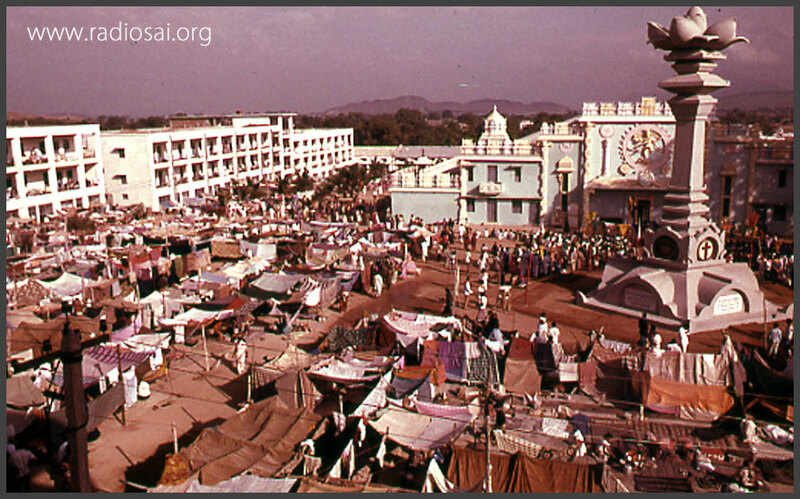 It was the time of Dasara celebrations in 1974. Like every year people were streaming into the ashram from all parts of India and elsewhere. 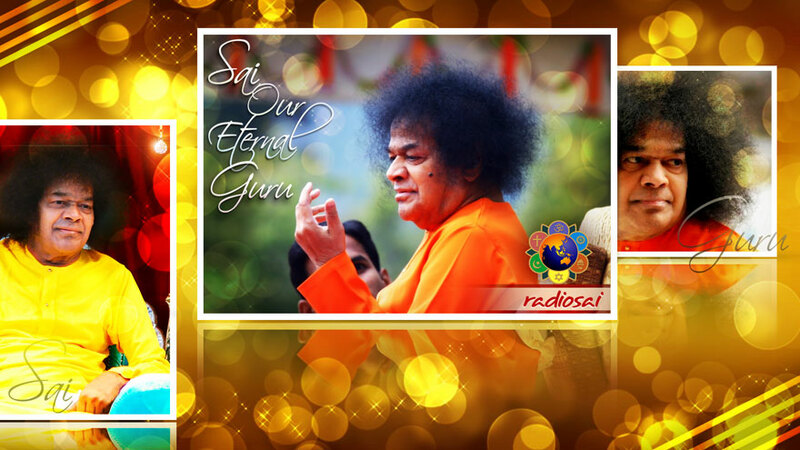 “I laughed within myself listening to Swami. Will a person worry about his box and bag if Swami is calling him?! In any case as per His instruction I had the boy accompany me. Once I reached the shed it was not difficult to identify him after all the detailed description that Swami had given. I paid my respects to him with a namaskar and then told him that Swami is waiting for them outside the Mandir. “Wow! What an experience that was! 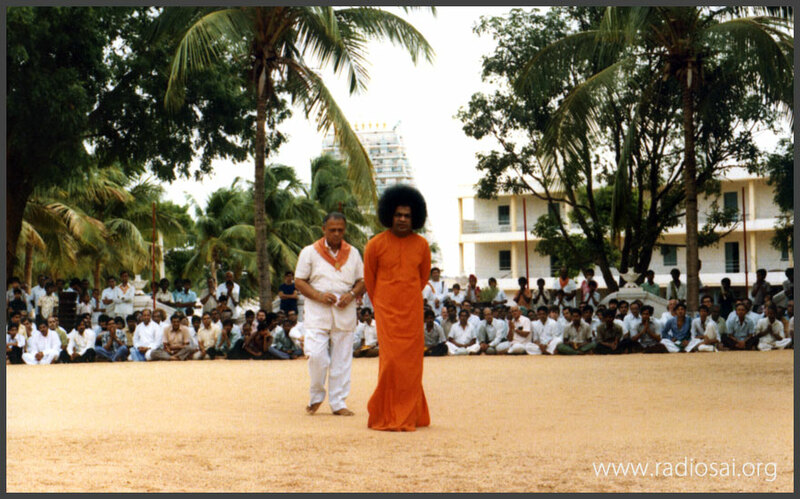 How I marvelled at Swami's all-encompassing vision that presides over the past, present as well as the future! “With deep humility and politeness I explained to the old man that the boy I had brought would look after their luggage until they returned, and then took them along with me to Swami. The moment I was in His presence I said, 'Swami, this man repeated exactly what you had said.' 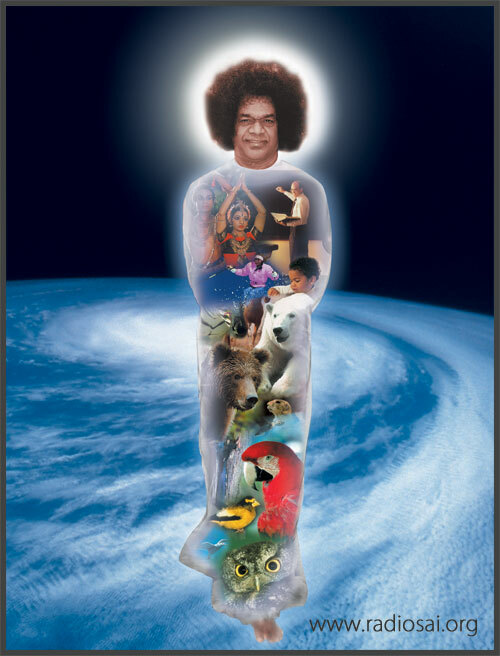 'I know it,' Swami remarked immediately and added, 'I am also aware of your garrulousness. That is the reason why I asked you to take the Kannadiga boy also with you.' Feeling admonished, I slapped my cheeks loudly, sincerely seeking His forgiveness. “It is my hand or feet, so I know,” Prasad replied matter-of-factly. This freedom, this Bliss can be experienced when in our practical lives we live the principle of - The Oneness of All Beings. This is what Swami, the Supreme Preceptor, demonstrated all His life. This is the reason why He is always in Bliss. Yes, it is not easy but it rewards us handsomely when we decide to put in sincere efforts to translate this in our real lives. Well, if we can do this, or at least make an honest beginning, we would have taken our first solid step towards experiencing ultimate freedom, perpetual happiness. And happily be the reason for a sweet smile playing on the lips of our Sai Sadguru, the Soul of our lives. This indeed would be a beautiful tribute to our merciful Divine Master.